This Event has no scheduled dates at this time. It last occurred on Monday, February 18, 2019. Currently being used to teach letters and sounds in Kindergarten classrooms within Dare County Schools, Letterland is a unique, fun, phonics-based approach to teaching letters and sounds to preschool learners. Using fun stories and characters, Letterland invites young children to learn while providing a seamless way to promote phonics within existing classroom curriculum. 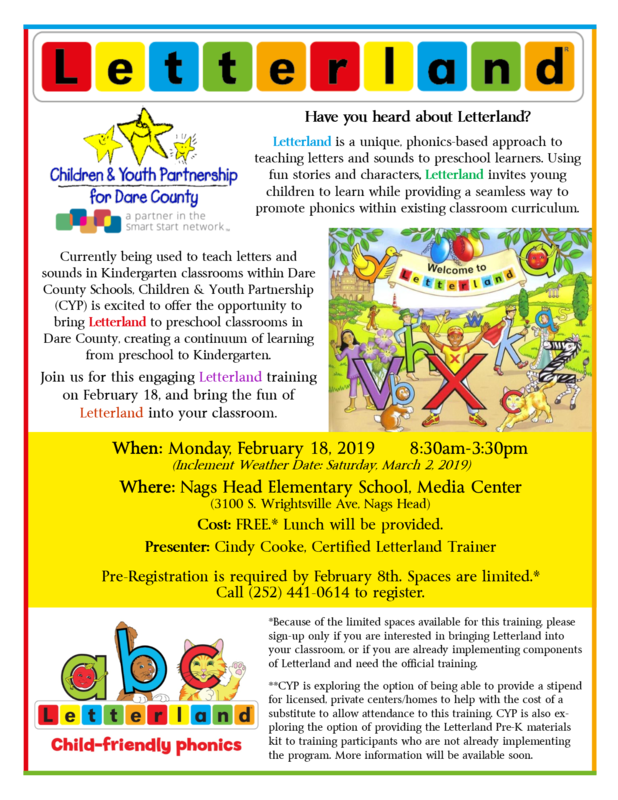 Children & Youth Partnership (CYP) is excited to offer the opportunity to bring Letterland to preschool classrooms in Dare County, creating a continuum of learning from preschool to Kindergarten. Join us for this engaging Letterland training on February 18 from 8:30am-3:30pm at Nags Head Elementary School, and bring the fun of Letterland into your classroom. Cost: FREE. Lunch will be provided. Pre-Registration Required*: Spaces are limited for this training. Registration must be received no later than Friday, February 8 to confirm registration. Register online by clicking here or call 252-441-0614. *Because of the limited spaces available for this training, please sign-up only if you are interested in bringing Letterland into your classroom, or if you are already implementing components of Letterland and need the official training.